Last week, I went to the doctor for a checkup for the first time since I was in High School. I could not believe how bad the user experience was. I’d like to be clear that I’m not blaming this particular doctor, as I have had pretty much the same experience at every doctor I have ever visited. I think the problems are endemic to the health care industry as a whole. I called the doctor’s office at 3PM on a Thursday. They were closed (they only have morning hours on Thursday) so I had to call back on Friday. When I called back, the receptionist took my name, address, phone number, and email address and we scheduled an appointment. Criticism: Not being able to make an appointment during business hours is pretty bad. Even banks stay open until 7pm now. What I Want: I would like to be able to make appointments online at any time. I think you should be able to schedule appointments by phone hours at least until 7pm and preferably later. At the very minimum, I should be able to call and schedule an appointment from 9am-5pm Monday-Friday. This is a minor gripe, but going to the doctor is a stressful experience. I’ve always thought that a little bit of interior design work would go a long way to ease that stress. Kathy Sierra described it best when talking about her dentist’s office in Reducing Fear is the Killer App. 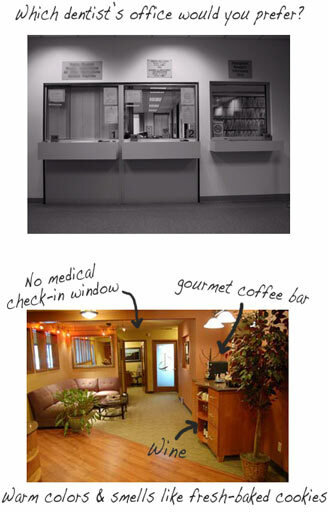 Suffice it to say that this office (and every other doctor I’ve ever gone to) looked pretty much exactly like the black and white picture in Kathy’s article: receptionist behind a medical window, ugly chairs, sterile smell. Criticism: The office was functional but it didn’t do anything to put me at ease or improve my experience and actually increased my stress. When I came in for my appointment they handed me a clipboard with several forms to fill out. The forms were an Insurance Form, a Medical History, and a Privacy Notice. On each of these three forms I had to fill out my name, address, phone number, and social security number. All in all filling out the forms took about 15 minutes. Criticism: This was terrible. There is no reason I should have to fill out the same information on multiple forms. When I got to the office they should have the completed forms waiting for my signature. If I did not fill the forms out in advance they should have copies of the forms pre-filled with the information they took over the phone. I think that the user experience at doctor’s offices is so bad because of the way that doctors in the United States get paid. Most doctors are paid primarily by insurance companies, not the patients themselves. Since prices are fixed by the insurance companies the doctors don’t have much incentive to providing a better experience. This isn’t to say that insurance is a bad thing, but rather that the health industry is a prime example of the mediocre product you get when the person who consumes a service isn’t the person who pays for the service. Enterprise software is another example of a terrible user experience that is the result of the users not being the ones who actually purchase the product. Furthermore, since the cost of switching doctors is so high (in time, inconvenience, and stress) and the services provided are so similar doctors do not have to worry much about patients leaving. Standard, open formats for electronic medical records could provide some hope by lowering the cost of switching doctors. Unfortunately, I don’t think we’ll see them any time soon. This doctor in Brooklyn seems to be trying some interesting things. He doesn’t have an office, makes house calls, and is available by cell phone, IM, email, and video chat. I think his model may be a bit extreme, but it does sound like it would serve healthy young people better than the existing setup. The Electronic Medical Record System that he uses looks interesting, but doesn’t seem to have much focus on the patient themselves. I am hopeful for the future. My generation is the first to grow up with computers and the internet and my peers are just now finishing medical school. As a more tech savvy generation of doctors moves into private practice I may get to see some of the things I want actually implemented. In the meantime, if anyone knows of a doctor in the DC area who seems genuinely concerned with the experience of their patients please let me know.